Bring focus to your mission for modern learning. Whether youre upgrading a department, school, or district, the authors offer a systemic framework, proven processes, and practical strategies your team can use to achieve your vision. Explore the building blocks for creating a curriculum that supports modern learning, an assessment system that captures evidence of 21st century skills, and instruction that aligns with modern learning principles. Learn strategies for engaging various constituents in envisioning a future-oriented mission. Apply a backward design process for aligning all aspects of the system with the mission. Consider an innovative approach to designing a modern curriculum. Explore a framework for assessments that can enhance learning as well as measure it. Review instructional procedures for personalizing learning and developing independent learners. Examine the LearningBoard, a robust technology tool for communicating modern learning 24/7. “This book provides a refreshing look at contemporary schooling focusing on the impacts for learners and not the typical inputs from the curriculum/programs and/or teachers. This book provides a blueprint to help educators frame learning for our contemporary learners/context. The authors masterfully weave theory, practice, and the use of models, making this both a provocative and practical book. 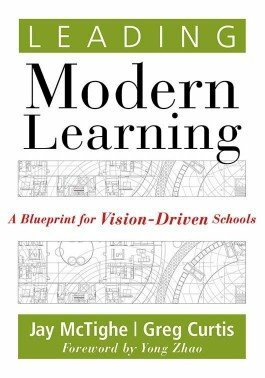 “This book asks leaders to look at schooling through the needs of the modern learner. The authors skillfully weave together theory, process, and exemplars of what it looks like in practice. This is a must-read for educational leaders around the world. This book is highly recommended to educational leaders who are striving to ensure their schools are impactful as they prepare learners for an often uncertain and globally connected future.